1. touring costs money. Duh, but there's often a big difference between gross and net. Bands can be making five figures a night, but if they haven't got their costs under control, then the net is in danger. 2. touring expenses are not scalable. Essentially, the more shows you play, the more money you earn, but also the more money you spend (unless you set up a residency somewhere). 3. touring and live performance require constant output. Commenters above got it right -- to make money as a live performer, you have to play shows. Stop playing shows, and the cash flow stops as well. 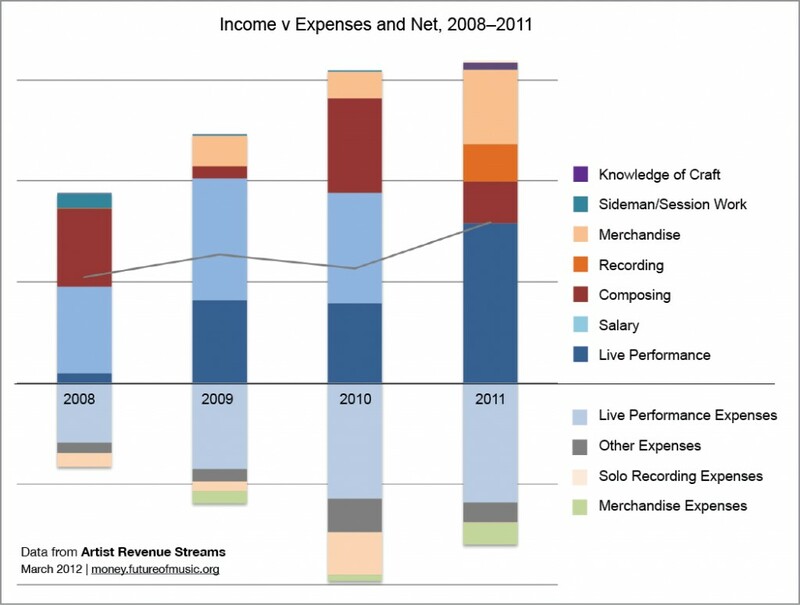 This makes touring unique, but also very different from income earned from sound recordings, compositions, or brand which can continue to earn money over time. And, as a commenter mentioned, there's teaching and other income-earning activities based on their knowledge of the craft. We have data about these revenue streams as well. The financial case studies are one of three data collection methods that we've been employing as part of the Artist Revenue Streams project. We've also conducted 80 interviews, and we ran an online survey that was completed by over 5,000 US-based musicians and composers. More published stuff here, with additional reports forthcoming.